Okay, people. According to the reader survey I never finished telling you about (answers to the first half here), only a few of you hate my Project Life updates. I figured if a lot of you said you hated these, I would stop doing them. But you didn't, so sorry to the 31 people who aren't fans, but this is still happening. I know it seems insane that I'm still making time to work on this with all the craziness that's going on in my life, but I don't think you guys really understand how much I love scrapbooking. I love it a lot. Also, it's something I feel I'm good at. 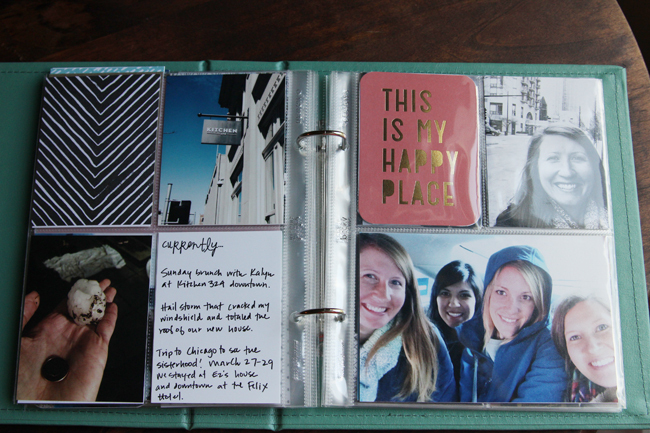 I'm really proud of my scrapbooks and like sharing them with people. 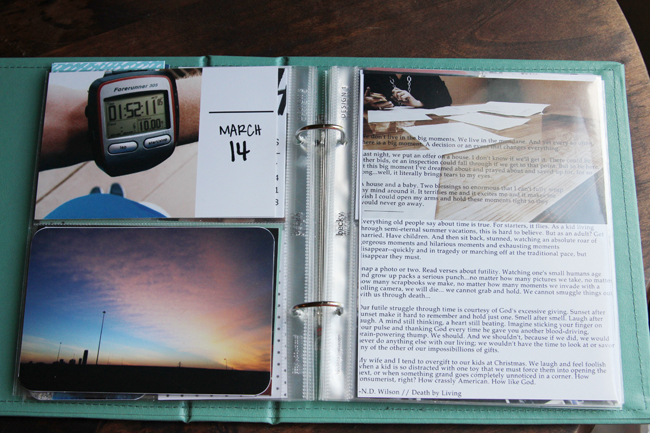 For those who need a refresher, Project Life is a type of hybrid scrapbooking where you use photo pockets to insert pictures of various sizes and mix those with journaling cards. Check out the Project Life website here for more info. You can do physical or digital Project Life depending on what you like. Mine is a 6x8 size. I've gotten a few questions about this on my first post, so I'll answer it here for those who are wondering: How do I print my pictures? 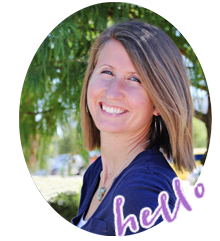 I currently print my pictures one of three ways: Shutterfly, Persnickety Prints, Walgreens. I did Shutterfly most recently because I got a code for free prints and I was already buying something else so shipping was not a factor; Persnickety Prints caters to Project Life folks and offers prints in many different sizes, along with cardstock prints and other things like that, plus the quality is amazing; Walgreens makes the worst-quality prints, but it's cheap and easy, and I don't have to wait for shipping. My ultimate goal is to buy a home photo printer, but those are expensive so we'll see. ^^^Wondering what the blank 18-week picture is? Long story short, I lost the battery charger to my point-and-shoot, and so I can't get that picture off my camera! I'm hoping we unearth the charger during packing. ^^^That black-and-white picture of Jordan and I is a 4x6 size. I cut it in half and used both halves in the 3x4 spots. ^^^I made those "Currently" 3x4 cards in photoshop and printed them on cardstock. So that's what my book looks like so far! 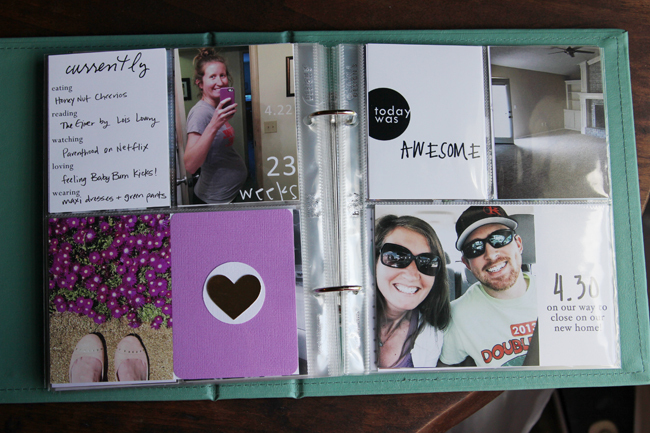 Are any of you doing a Project Life book or any other kind of scrapbooking? 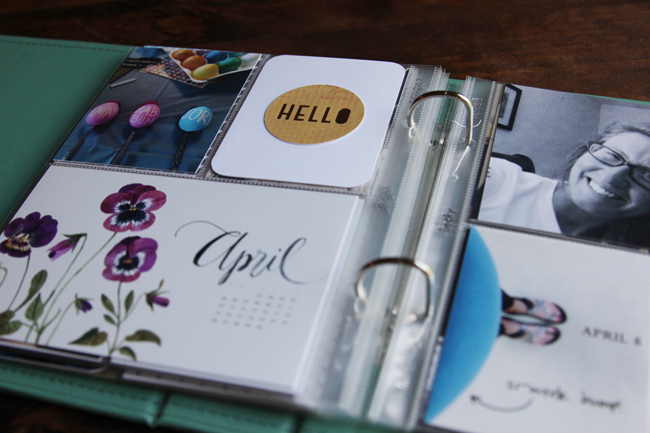 I love getting ideas from other people, so send me any links or ideas that you use in your own scrapbooking. Thanks! 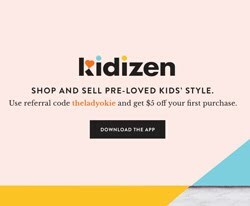 Any questions about Project Life? Leave them in the comments or email me! I really love this and think I want this to be my new thing when we are all set up next year! I did one for 2014 in a project life kinda of way, and there were things I liked about it...and I wonder if I did more of it if I'd like it more (and feel better at it). But, I still like having books printed (most recently via Artifact Uprising). I've done smaller books that way, for trips and whatnot, usually as gifts for family (and then I print one for me), and I like the look of them. But I do like the versatility of including other things beside just photographs. 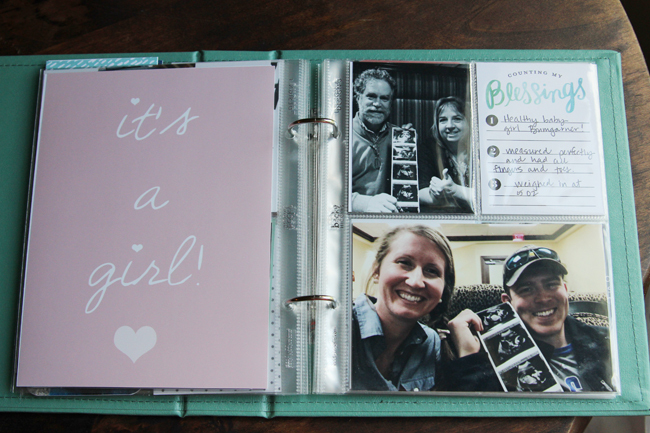 I get really inspired by other people's scrapbooks (the blog Stephanie Makes especially at the moment) but I feel like I can't replicate it on my own. 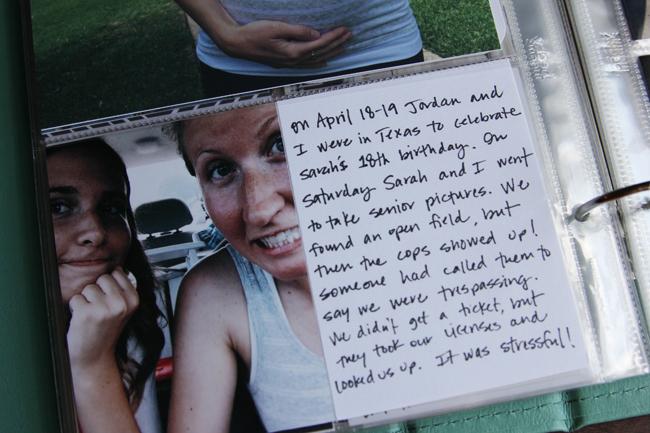 It feels like scrapbooking is definitely more expensive. It gets crazy!! Did you like Artifact Uprising for printing? So beautiful. 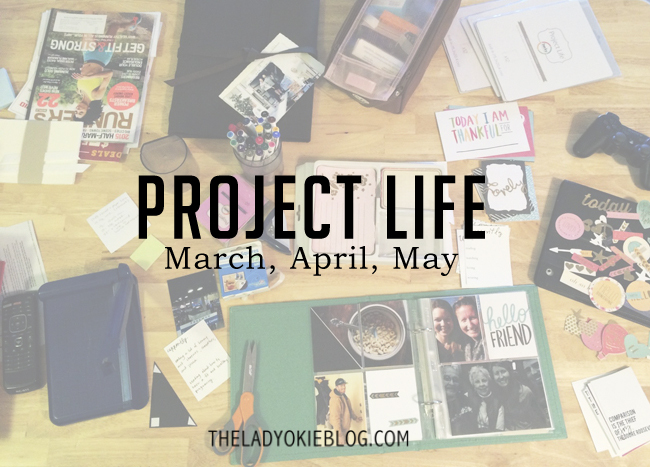 I love the simplicity of Project Life! I wish I wasn't a poor college kid so I could afford to do this! Lol. 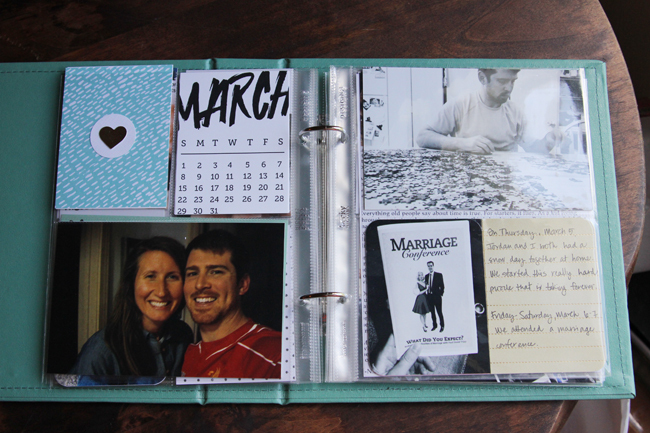 I really like your scrapbooking. I love to see how you put it together and all the little memories that get added. So creative. I should really do one next year. 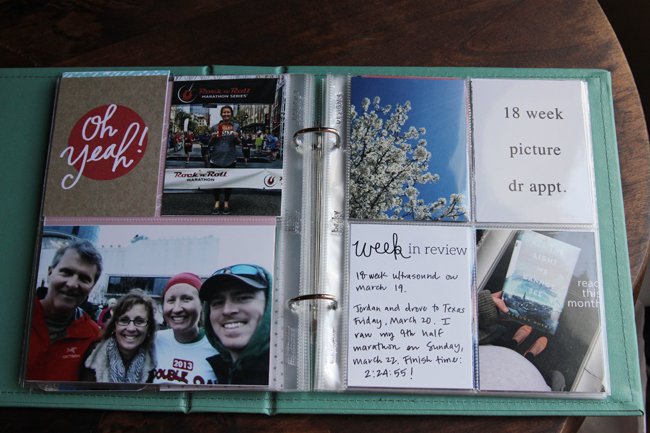 I have been scrapbooking digitally for about 5 years and recently switched to digital Project Life. Love it! Awesome! I would like to try out the digital version at some point. It would probably save me lots of time, but I do love doing it by hand too! 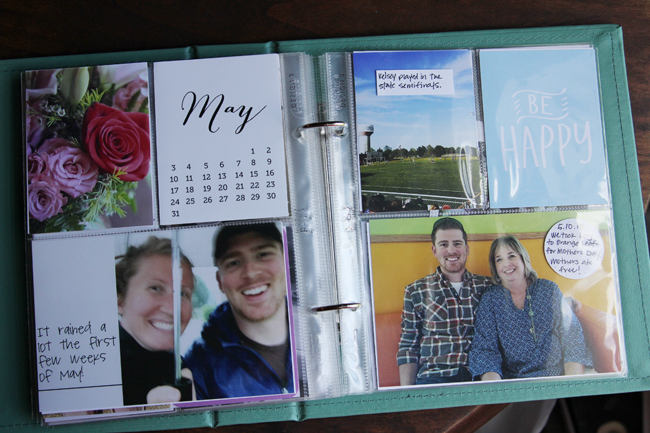 Once I finish my current scrapbook, I'm jumping on the project life book train asap! These pages all look SO great! 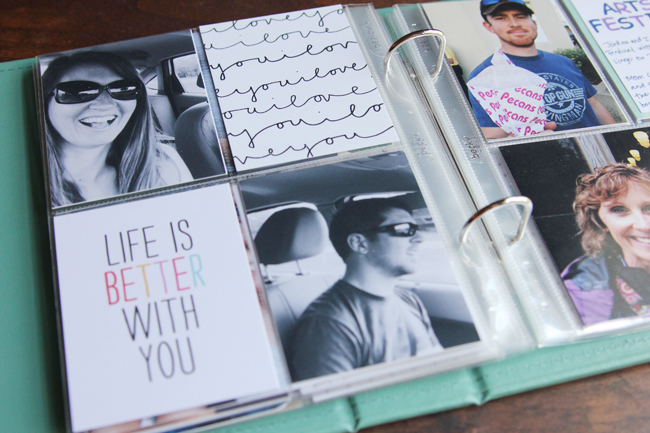 I love how you made your regular size print photo (4x6) work in two slots of the page! Smart girl! I spent yesterday afternoon working on a scrapbook from when we were dating each other (I'm putting all our letters back and forth and such together in one spot). I started it last year and made great progress... then I got distracted and somehow a year passed, haha! I'm working on finishing it now! I just love that you do this! I REALLY need to be better about printing pictures! It looks amazing. You're right, you're ggod at this thing! What amazing memories that will make. I really like the 4x6 of you and Jordan that you cut in half to fill 2 spots on the same page. I also really like the Currently cards! I love these! :) You really are creative/talented and I like that these are so unique. I honestly haven't seen anyone else do it this way!! i'm a little jealous of your gumption (yesss) to get this done! I would loveee to do project life! You are adorable. And these are my favorite so BYE to those 31 people. The actual "currently" that's written at the top is a typed font. The other stuff is my handwriting. You should do it Sarah! I had my friend bring me a Project Life all the way to Myanmar and I haven't regretted it one bit! I'm planning on starting these once our little bit is here!!!! SO FUN! Project Life is EPIC!!! So much so that I neglect real life for Project Life. ha! It's fun to see your pages! I'm glad you can print some things on cards tock from home. I have of course included washi tape in my book and really like it. 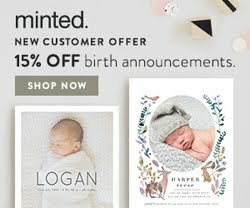 I'm considering boycotting Shutterfly! I can't figure out how to download the pictures back to my computer/phone that I loaded on there. Occasionally, I want to have them as my backgrounds. Does that make sense?! Do you know how?